The reigning World Series champion Kansas City Royals faced off against the American League West champion Texas Rangers at the fourth annual Big League Weekend last Friday and Saturday in San Antonio, Texas. The games — the Rangers won both — took place at the Alamodome, which underwent a major transformation to host baseball in a stadium originally designed for football. For the fans (attendance was 61,128 over the two games) it provided a chance to see the defending champions play in a city hungry for Major League Baseball. 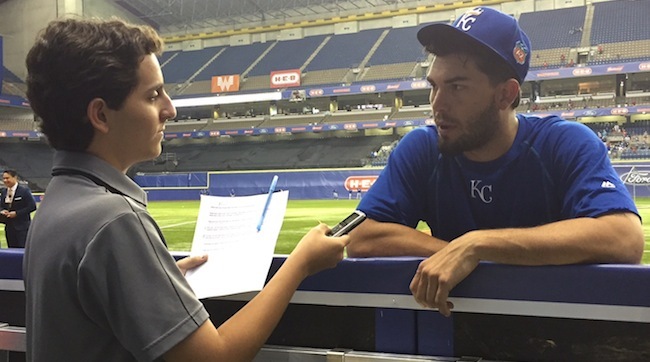 For the Royals, it was another stop on their World Series tour, which is one the players have thoroughly enjoyed. Some of the opportunities included Eric Hosmer and Salvador Perez visiting with The Tonight Show host Jimmy Fallon; Mike Moustakas, Drew Butera, and Jeremy Guthrie pelting late-night talk show host Jimmy Kimmel with paint balls with the help of actors Eric Stonestreet and Seth Rogen; and a World Series parade through downtown Kansas City with over 800,000 Royals fans. Coming off back-to-back World Series appearances, the Royals aren’t taking this upcoming season lightly. They’re hoping to become just the 13th team to ever reach three consecutive World Series. Just a couple years ago, many would have laughed at the thought of the Royals shooting for three straight Fall Classics. Prior to 2014, the Royals had last appeared in the playoffs in 1985, also the year they last won the Series. Hall of Fame third baseman George Brett was on that ’85 team. Brett, the all-time leader in hits by a third baseman, is now the Royals’ vice president of baseball operations. He dreaded talk about the 30-year drought as much as anyone did, as he’s been a Royal almost his entire life. Along with the glamour that came with being champions came a target that every other team in the league hopes to hit. 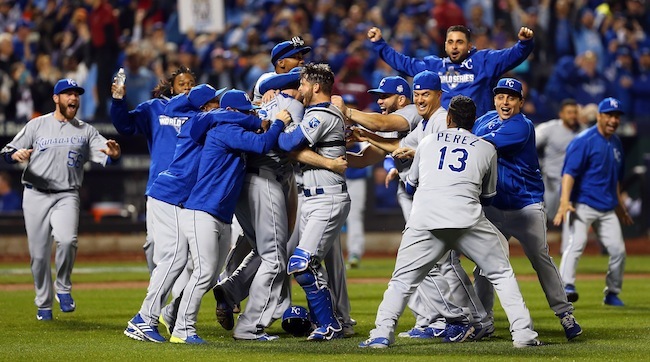 The Royals already have a little taste of what that’s like, having lost the 2014 World Series. This season, however, they’re coming in as winners, and the league is surely ready. Losing many players to free agency regularly plagues championship teams. The Royals, who have been lucky enough to retain almost their entire roster from last season — seven starting position players and four members of the starting rotation will return — are poised to make another run into late October. Many times, champions hurt themselves the most. Perhaps no team knows that better than the San Francisco Giants, who won three titles over the last six years yet missed the playoffs each season after they had won it all. The Royals, however, are determined to be fueled by the same fire that has motivated them the last two seasons.